Anishka Clarke and Niya Bascom of Ishka Designs have an eye for blending art and culture into contemporary spaces. In one of the City of Light they have designed a gorgeous Parisian pied-à-terre filled with unexpected pops of color, a fabulous art collection, and global furnishings and textiles (like the many colorful kilims that can be spotted throughout the apartment). The bright yellow staircase in the hallway is one of our favorite moments in this open and airy space. Your eye just follows the shade up the curvy design of the staircase. In the living room you can see the diverse collection of pieces that had to be incorporated into the design. 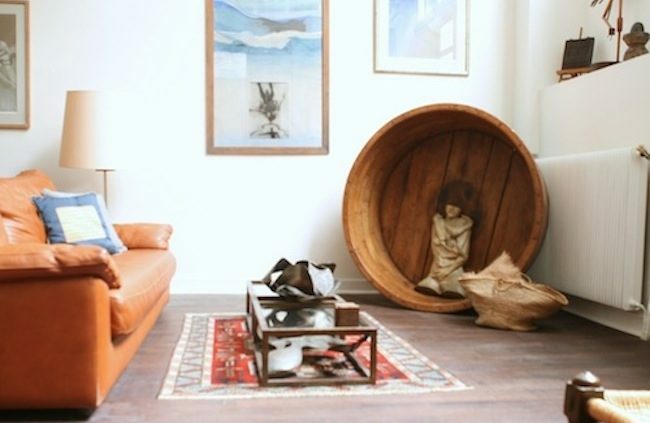 In the corner sits a wine barrel that looks like a hand-crafted sculpture from afar. 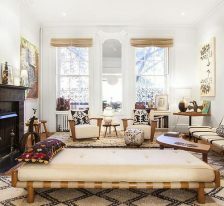 Chairs from India sit on the other side of the living area. They are the foundation for a cozy lounge area. 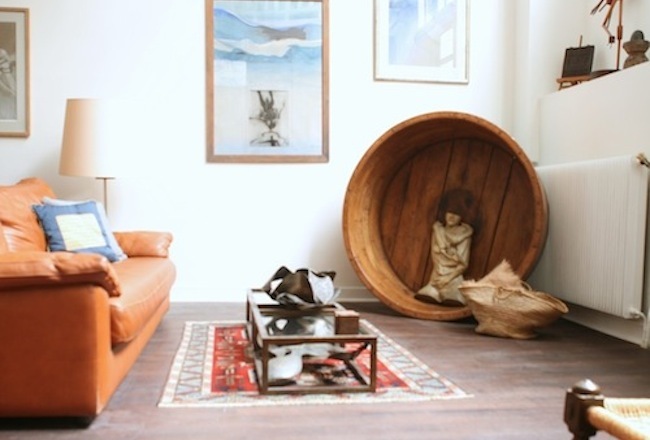 There is a wonderful blend of the old and the new in this apartment. A pair of Louis chairs was a family heirloom, left untouched in the original fabric. A brightly colored kilim adds even more color to this bright vignette. To keep the attention on the various art and sculptures in the space, a neutral backdrop was used. It was a smart way to create an uncluttered look that let’s the focus rest on the homeowner’s extensive collection.